On Saturday last week I had the pleasure of photographing James and Emma’s St Austell Registry Office wedding. Together for ten years, Emma and James had eloped to Cornwall to get married with their son and best friends from Harlow in Essex. 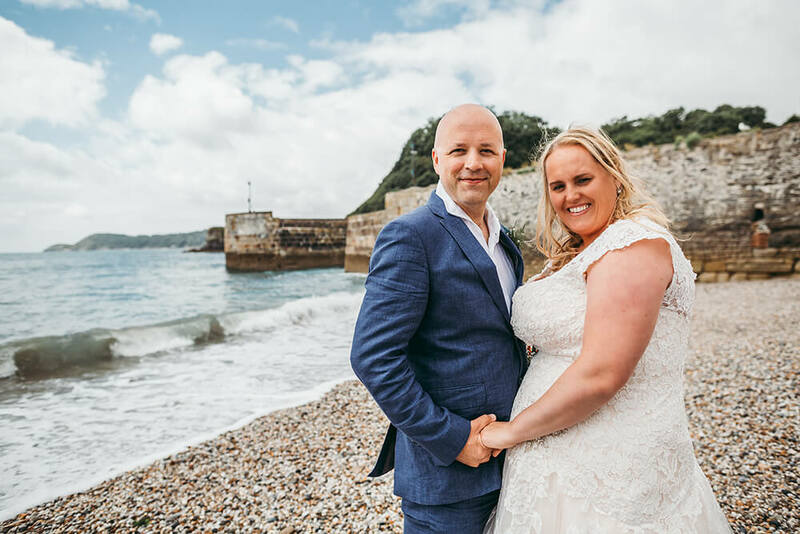 Having tied the knot in St Austell’s local registry office, we headed down to Charlestown in St Austell for some wedding pictures on the beach and around Charlestown Harbour. Not knowing the local area, Emma and James put their trust in me to recommend a location which would be a perfect setting for their wedding photos. Charlestown for me was an obvious choice, not only due to it’s proximity, but the beautiful scenery on offer ensures an abundance of opportunity for wedding photography. Famous for its collection of tall ships and traditional appearance, Charlestown’s original Grade II listed harbour was constructed between 1791 and 1801 by Charles Rashleigh and the location has appeared in several television dramas and films over the years. More recently the BBCs popular programme Poldark, which is based on a series of historical novels written by Winston Graham, used Charlestown Harbour as one of the filming locations. This preview shot was taken on beach to the left hand side of the harbour where we were able to spend a few minutes enjoying the sunshine before some heavy showers set in. If you are considering eloping to Cornwall to get married and are looking for a local wedding photographer to capture your special day, I offer packages purposely built for this occasion. Further information can be found here. To check availability, please feel free to get in touch. I would love to hear from you.